Tired of those big rectangular wire boxes for crating your puppy or dog? They may be functional, but boy are they ugly! DesignGo! 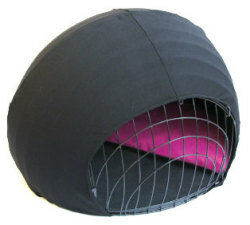 has created something truly unique, but a sure heck-of-a-long-time coming... an elegant spherical-shaped dog crate for a rich dog who resides in a chic, modern home. It's called the eiCrate. Why a rich dog? Well, the eiCrate is a bit pricey, but worth the money when you consider the workmanship, materials, and features involved. Not to mention the beauty of the eiCrate! * Each eiCrate shell is hand made in black, white, gold, or silver powder-coated steel wire. 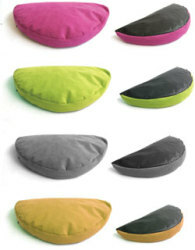 * Its inner mat is 100 percent rubber, leak proof, and very easy to clean. * The shell breaks down into only two parts, so the eiCrate is easy to put together, take apart, and store. * The eiCrate has two dog-secure locks; no escape is possible without your help! The dimensions of the eiCrate are: Height 24.5” Total width 36”, Depth 34”, Door Height 14.5”, perfect for dogs from 4 to 40 pounds. 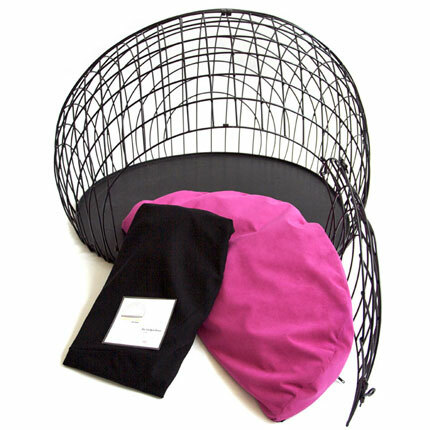 The rubber liner totally fills the bottom of the eiCrate and is sold with the crate for $325. For comparison, a high quality rectangular crate of an equivalent size would cost over $200 with a metal floor. But you can also purchase the whole enchilada, which turns your puppy training crate into a lifelong private apartment for your grown dog... provided she's not a very big dog. And what rich dog would not want her own apartment? The eiCrate Starter Oeuf Beds Package includes the eiCrate and liner as well as a bed, cleverly designed to cover only half of the floor so the other half can be used to place food and water and toys. This cosy oeuf (egg) bed measures 31”X 28” X 3” and comes in four colors, shown to the right. The oeuf is covered with stain resistant micro-fiber on one side of it, and 500 Denier Nylon Cordura on the other, so your dog's comfort is assured whether he's cold or warm. And if you want to give your dog privacy and shelter from your late night parties, and a bit more warmth, the eiCrate Starter Package also includes a fitted cover made of double-backed cotton jersey. The price tag for the eiCrate Starter Package is around $500.... and there is really nothing to compare it to. EDITOR'S UPDATE: This item is now available at Gernerate.